Waswa hung on his cross for several days, rejecting appeals from Christian friends to be taken down. Villagers gathered around to offer their prayers. He was eventually taken down from the cross, dying from the nail wounds, which had become infected. He refused all medical help and died on a Sunday, exactly two weeks after his crucifixion. 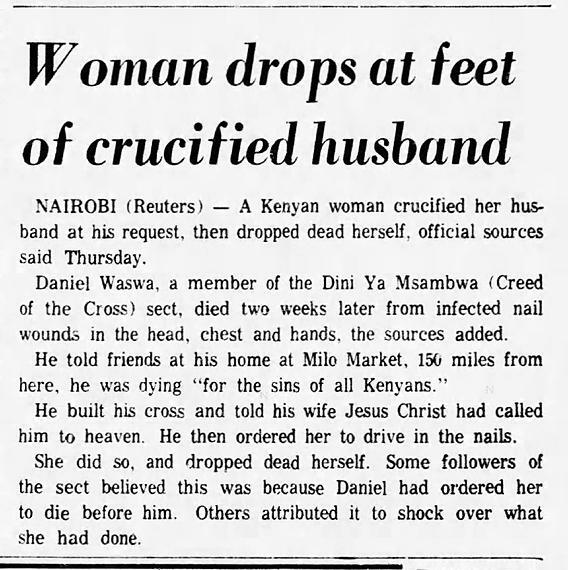 I'd never heard of the Dini ya msambwa sect before, but some googling reveals that the name is better translated as "Religion of the Ancestral Customs" (not Creed of the Cross). It was founded by Elijah Masinde. 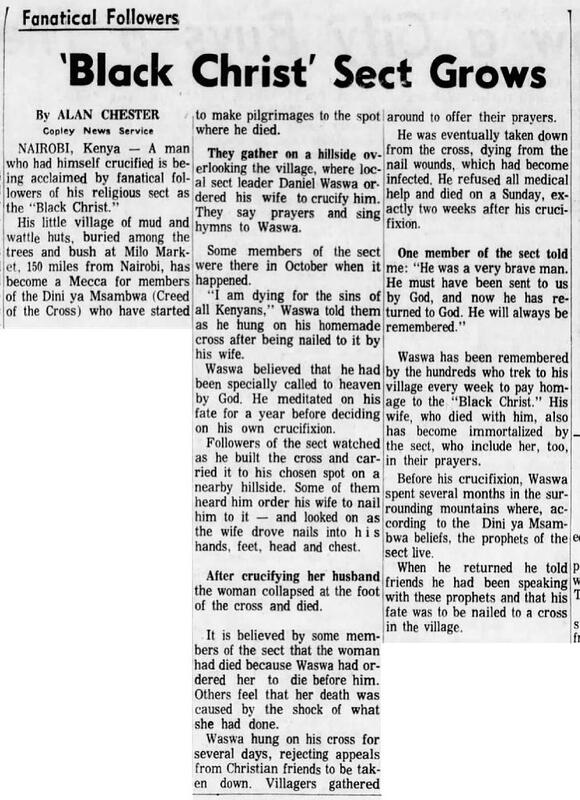 The stories about Waswa make it sound like a radical Christian cult, but Wikipedia defines it as "an African traditional religion that has been labeled an anti-colonial religion." 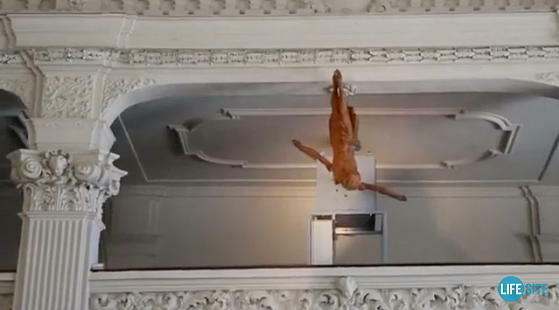 Created by artist Manfred Erjautz and installed in the Spitalskirche in downtown Innsbruck, with the permission of Bishop Hermann Glettler. the upside-down wooden corpus projects from a mechanism on a shaft that is embedded in the torso. The severed arms of the sculpted icon of the Crucified mark the minutes and seconds on the timepiece. Created around 20 years ago in Syosset, New York. The figure of Onionhead is supposed to represent "peeling our feelings, as a way of healing our feelings." 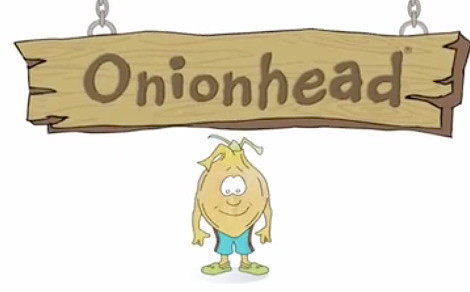 Onionhead's motto is: "peel it—feel it—heal it." The EEOC said Syosset, New York-based United Health Programs of America Inc. and its parent company, Cost Containment Group Inc., which provide customer service on behalf of various insurance providers, has coerced employees to participate in ongoing religious activities since 2007, including group prayers, candle burning and discussions of “spiritual” tests. The EEOC said the religious practices are part of a belief system that the defendants’ family members created called “Onionhead.” It said employees were told to wear Onionhead buttons, pull Onionhead cards to place near their work stations, and keep only dim lighting in the workplace, none of which was work-related. Employees who opposed taking part in these religious activities or did not participate fully were terminated, the agency said. More info about Onionhead at the Harnessing Happiness Foundation. 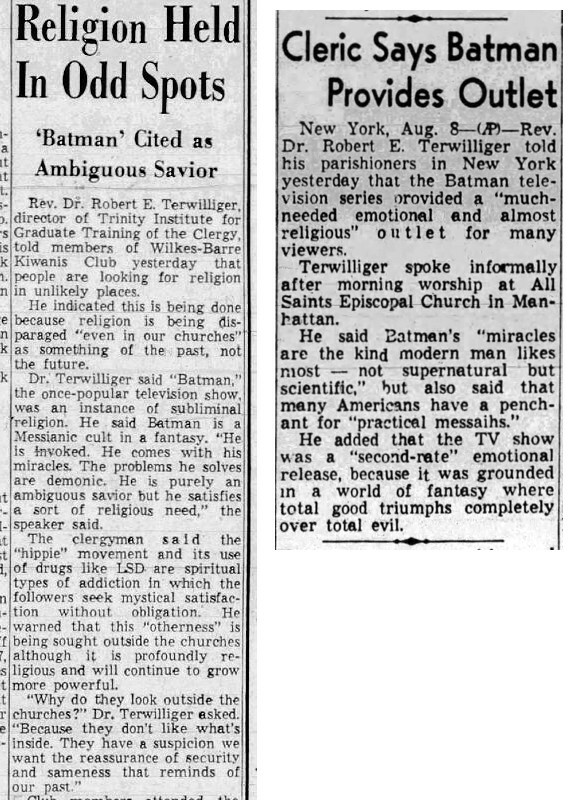 Dr. Terwilliger said ‘Batman,’ the once-popular television show, was an instance of subliminal religion. He said Batman is a Messianic cult in a fantasy. “He is invoked. He comes with his miracles. The problems he solves are demonic. He is purely an ambiguous savior but he satisfied a sort of religious need,” the speaker said. 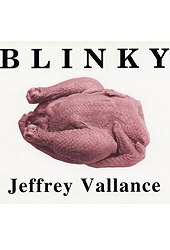 "were finally condemned when one of the bishops, more zealous in his presentation of the case than mindful of the dignity of his rank, presented them with a live chicken and ordered them to wring its neck. 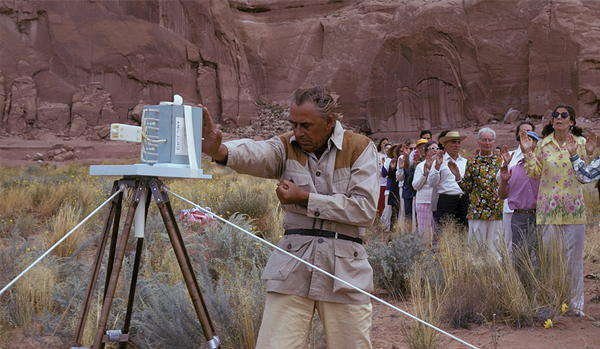 They refused to kill the bird, and were deemed beyond hope of redemption. Ignoring the arguments and threats of the assembly, they refused to recant and were hanged upon a gibbet." The execution of these heretics, as near as can be determined by modern scholars, was ordered because it was felt that "their attitude implied a dualist-type belief in the transmigration of souls through the animal kingdom" and suggested that they were Manichaeans. The events at Goslar — and this group was not alone among persecuted Christian groups in the eleventh century C.E. in its refusal to kill animals — are often treated by scholars as an important step toward the twelfth century full-blown assault on heresy by the Church linked to the newly proclaimed death penalty for heresy. Nothing like a "church rave." 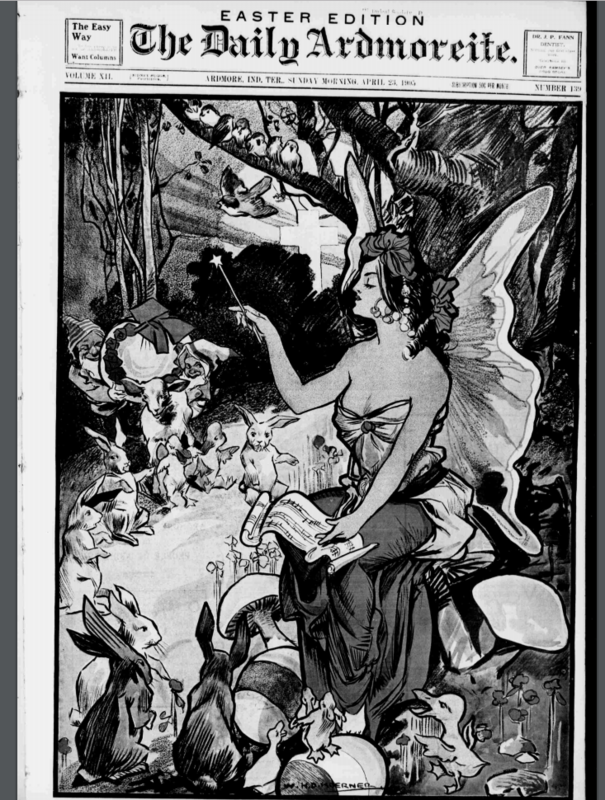 The creation of William Lane, who envisioned selling them to Catholics who couldn't eat meat on Fridays. Lane also planned to expand his offerings to include Mar-tunies, a cocktail size hot dog, and Sea-lomi, a salami substitute. It's not clear what became of Tunies. 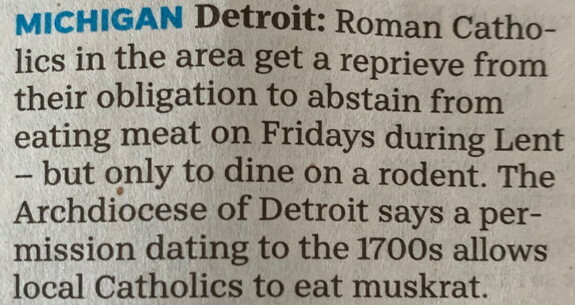 A reporter from Star News speculates that they may have been a victim of the Pope’s decision to rescind meatless Fridays in 1967 (although did the Pope ever weigh in on this issue? Some googling suggests it was actually the U.S. Conference of Catholic Bishops which made this decision, in 1966). 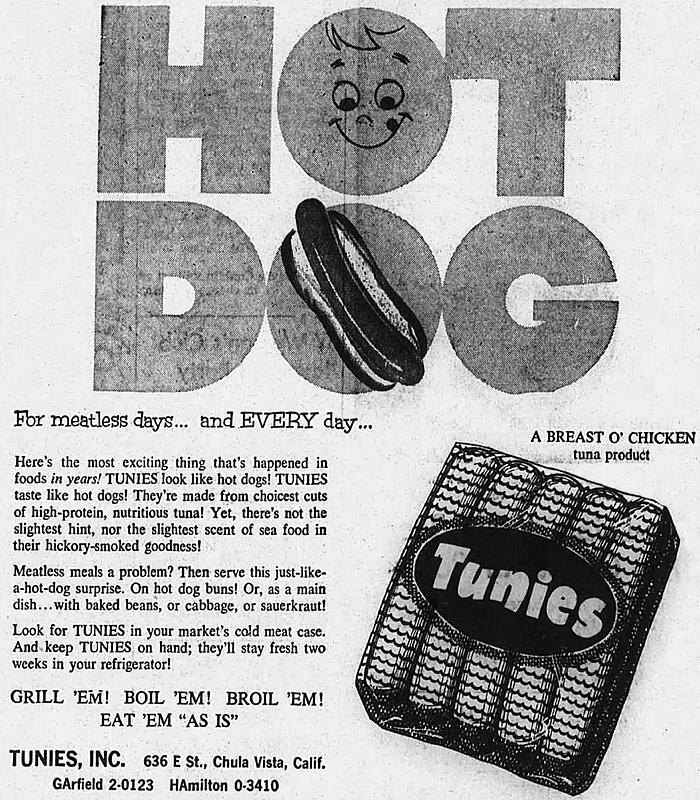 Anyway, I can't find any evidence of Tunies being sold after 1962.